Purist that I am, I cringed when I saw that you were desecrating watermelon with foreign ingredients; however, knowing that you would not steer me wrong, I made your watermelon margarita, and it was divine--the perfect summer drink! I'm a big fan of seersucker, which you just don't see very often in NYC. 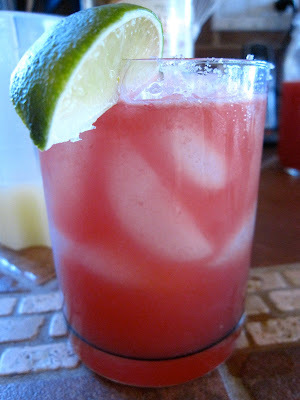 And I can't think of a better thing to drink while wearing it than this watermelon margarita. So refreshing! I can't imagine anything more delightful to sip at a beachside resort or poolside, wearing my favorite bikini! Thanks for this amazing recipe and when next summer rolls around, this is one of the first I will be pulling out to try! 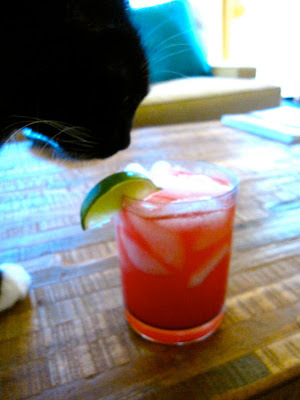 Speaking of margaritas-yesterday we made the most delicious and frugal for a crowd margaritas. We had one Jose Cuervo bottle from their six pack-bought it for the holidays for a friend who can have only certain liquids. We shopped at Costco a day previous and I bought a box of gorgeous looking mangos.I halved around the seeds and cross-hatched and removed the fruit from both and then went back Nd scraped for every other remnant of fruit. Put all this in the Cuisinart, added a generous amount of ice and lastly the premixed margarita mix. And blitzed the bowl full of mango loveliness till I. Heard and saw no cubes or chunks. Well let me tell you those were the best ever mango margaritas ever and it made 3 1/2 drinks. So try that next time you need summer drinks for a crowd but want the best ! Delinsky-it's a super page-turner we are reading for our "Dinner and a Book" book club. Plus on the reverse cover the author points you to her website offering to appear at your club's meeting or to call...it's a Randon House book.